Parsnips are a member of the umbelliferae family of vegetables, related to carrots, fennel, celeriac and parsley root. 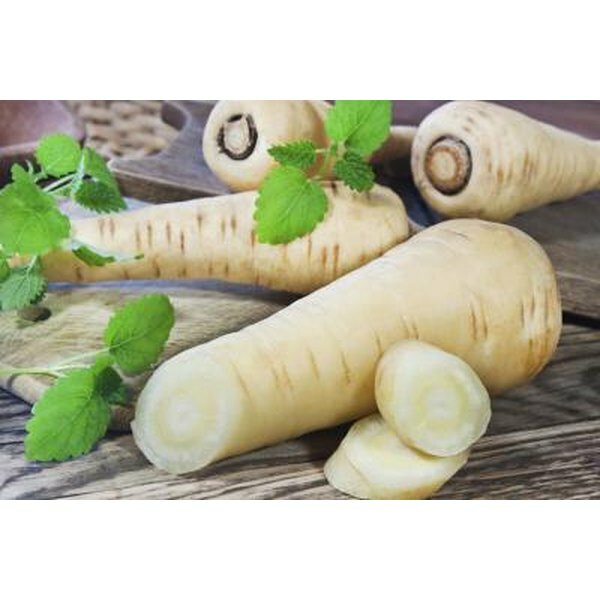 This creamy white root vegetable is low in calories, fat and sodium, naturally cholesterol-free, and high in fiber and several vitamins and minerals. Parsnip has 67 Calories and 2.67 g of Protein per 100 gram serving according to the nutrition facts provided by the USDA Food Composition Database. According to the U.S. Department of Agriculture Nutrient Data Laboratory, 1 cup of raw parsnip slices contains 100 calories and less than ½ g fat. It also has 1.6 g protein. The calorie content primarily comes from carbohydrates, at 24 g. Carbohydrates are the body’s preferred energy source, especially for the brain. A serving of parsnips also provides 6.5 g fiber, or 26 percent of the Daily Value (DV). Fiber helps lower the "bad" LDL cholesterol levels, improves digestive tract health and slightly lowers blood pressure. Parsnips are rich in several vitamins. A serving provides 38 percent DV for vitamin C, which helps form collagen; maintain capillaries, bone and teeth; metabolize protein; and absorb iron. Vitamin K, which acts a coenzyme during the synthesis of proteins involved in blood clotting and bone metabolism, is present at 37 percent DV. Parsnips contain 22 percent DV for folate, which aids in protein metabolism, prevents megaloblastic anemia, helps lower blood homocysteine levels and prevents neural tube birth defects. They also provide 13 percent DV for vitamin E which, along with vitamin C, is a powerful antioxidant. Parsnips have 8 percent DV for thiamine and pantothenic acid, and 4 to 6 percent DV for riboflavin, niacin and B-6. Parsnips are an excellent source of copper, providing 80 percent DV. Copper helps form hemoglobin and keep bones, blood vessels and nerves healthy. They have 14 percent DV for potassium, which is important in muscle contraction, maintaining fluid and electrolyte balance in cells, sending nerve impulses and releasing energy during metabolism. Magnesium, which helps build bones, manufactures proteins, releases energy from muscle storage and regulates body temperature, is present at 10 percent DV. A serving contains 9 percent DV for phosphorus, which helps build strong bones and teeth, release energy during metabolism and form genetic material, cell membranes and many enzymes. Parsnips contain 3 to 5 percent DV for calcium, iron, manganese, selenium and zinc. Foodreference.com recommends storing unwashed parsnips for up to two weeks in the vegetable bin of the refrigerator, wrapped in a paper towel then placed in plastic. They can be peeled and trimmed like a carrot. For pureeing or roasting parsnips, you can leave skins intact but soak them in soapy water first to remove any waxy coating. Try combining parsnips with other root vegetables, such as carrots, sweet potatoes or potatoes. To roast, drizzle with olive oil and herbs, and bake at 400 degrees Fahrenheit until tender.